250USD to build and took about three mounths to complete. I built it alone without any outside help. Peddler is very fast, I have yet to measure exactly how. spikes that can be fitted thrue the holes in his bumber. 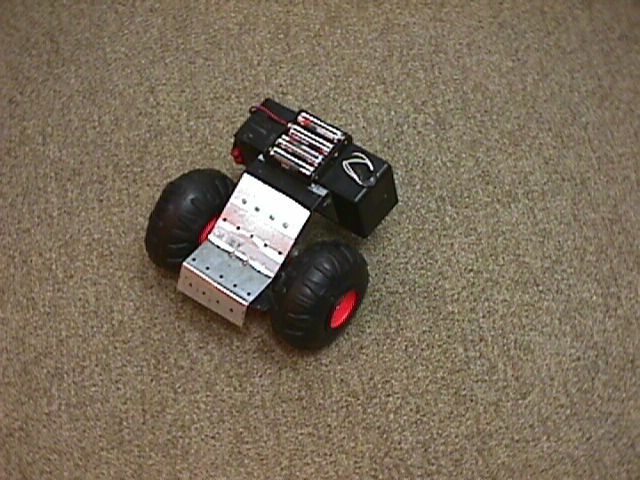 Peddlers chassis is made up of allumium pothole sheet. custom mounting holes for its axles. replacing it with two castors latter on for added stability. Peddler stands proud about two centimeters of the ground. with the addition of a second castor wheel to the back. -Peddlers radio has some, not much, RF interference. -Peddlers motors overheat and take a few seconds to cool off. -Peddlers batteries only last for about 45 minuts of use. there are lots of pictures peddlers page, on my site. lavalamp7@earthlink.net   btw: my name is Dan Ushman.